Thank you for your participation in the Internet Blackout day on Aug 14, 2012. Malaysians made history! It was only possible because of the thousands who used the tools provided by the open web to spread the information about Section 114A far and wide. The diversity and creativity of actions, from tweeting, posting on Facebook, designing banners and pictures, e-mailing, to even going offline the whole day, was astounding! It shows that many actions of protest are possible and indeed, necessary. The broad spectrum of people who came together also shows that this is an issue that cuts across political divides. Some tried hard to paint this citizen-initiated campaign as politically-motivated or influenced by partisan politics. In an extremely polarised political landscape like ours, initiatives such as the Internet Blackout Day are bound to get caught in the crossfire. But these quarters did not succeed in detracting from our aim, which was to raise awareness about the detrimental impact of Section 114A of the Evidence Act.Another positive outcome is that a lot more Malaysians now realise how faulty our process of law-making is.If only consultation had taken place before the bill becomes law. If only MPs — whether from BN or Pakatan, or the Independents — were given enough resources to look carefully at this law and their implications on the rakyat. If only MPs were given enough time to debate this before they vote. Fact is, there was zero consultation. Fact is, MPs are often badly stretched and under resourced. Fact is, we’ve seen more quality debate on Section 114A over the past few days than in Parliament when the bill was passed! If we take our democracy and its processes seriously, it’s our individual responsibility to keep our lawmakers on their toes. It’s our responsibility to educate and inform ourselves of various laws and policies that affect us, something that 40,000 Malaysians yesterday proved they were able to do. It’s also our responsibility to demand that out lawmaking process be consultative and transparent. We can’t mature as a democracy if laws are bulldozed through Parliament, only to have them withdrawn or discussed after much public protest. For those who were skeptical about the efficacy of a 24-hour Internet-based protest, we support the idea that online action needs tobe taken offline to effect lasting change. 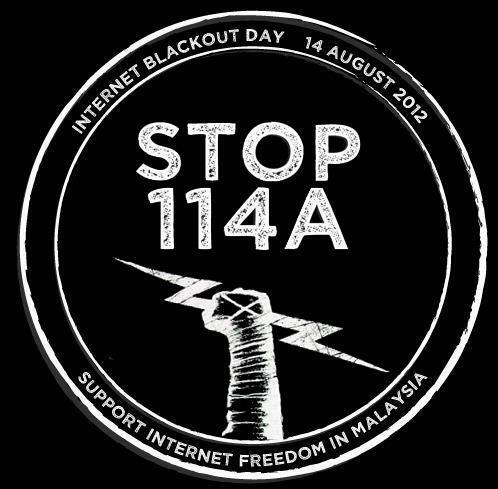 The Internet Blackout is only one—if the most visible—of many actions in the #stop114A campaign trail. For the #stop114A campaign team, the immediate next step is to take up the offer of Deputy Minister Saifuddin Abdullah to meet him and other like-minded BN MPs on how to take this issue further. The online community should also respond to the Cabinet decision to not review Section 114A, following the Prime Minister’s tweet in response to the popular online support for Internet Blackout Day. We will do so, but only after coming up with effective ways to put the pressure. There needs to be more than one action and they need to be online as well as offline, and done by as many sectors as possible, from the average Facebooker to the Net-based business community. How would you like to continue to be part of this campaign? We will use our Facebook page to keep everyone updated and will ask for your input and support. There will be more to come, as the campaign is not over until the amendment is repealed. We hope this platform becomes a space for healthy debates, ideas and discussion on how to take this campaign forward.